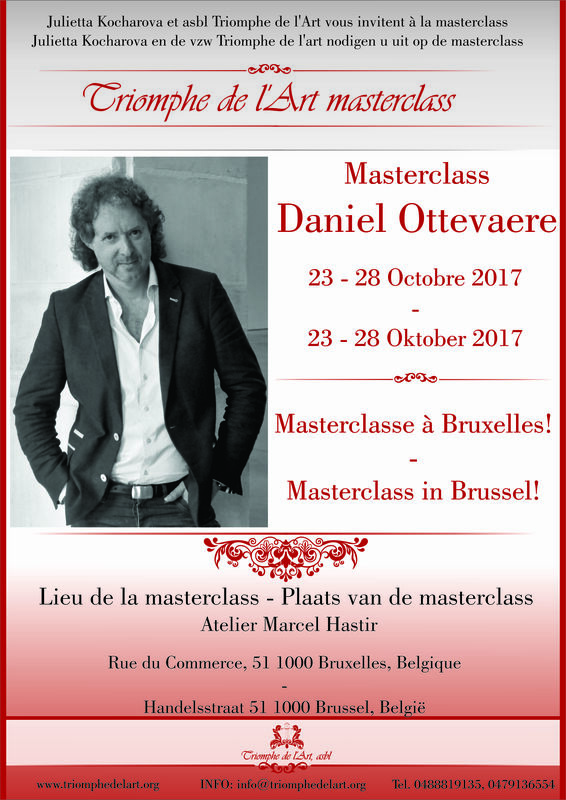 Location of the masterclass: Atelier Marcel Hastir, Rue du Commerce 51, 1000 Brussels, Belgium. Daniel Ottevaere was born in Brussels. He studied singing, lyric art and melody in Brussels, in Vienna and in Castelfranco-Veneto in Italy. Then, he settled in France (Paris and then Lille) and for four years, he has studied at the School of the Opera Paris and with Daniel Delarue. He started learning with (his teacher) José Van Dam a few years ago and still is. He takes part in several recordings: La Jolie Fille de Perth, Le Postillon de Longjumeau, La Muette de Portici (EMI), The Beatitudes, War and Peace (Erato), Boulevard Solitude (Cascavelle) and King Arthur (Koch). In another field, Daniel Ottevaere directed and adapted two works: Offenbach sur Canapé in 2001 and Cabaret Chauve-Souris in 2007, which are production made by the company called La Clef des Chants. Daniel Ottevaere is really concerned with passing on his knowledge. That’s why he is a singing teacher at the Ecole Normale de Musique in Paris and at the Valenciennes Conservatoire. Recently, he was giving singing lessons on France Musique during Stéphane Goldet’s programme, “l’Atelier des Chanteurs”). In 2007 and 2008, he sang in several opera recitals in France, in The Coffee Cantata and in Bach’s Cantata 85 during the Arques Lyric-Concerts Festival and during the creation of Gustav Rihm’s Vigilia, which is a Belgian creation within the context of the Bozar Season with Ensemble Musiques Nouvelles. Recently, he appeared in a recital in Paris within the framework of the musical season of Saint Merry Church (Diabolus in Musica, Les excursions de Méphisto) and also in Nancy during “Festival Nancyphonies” with the same programme. Then he appeared in Enghien Festival des Rencontres Musicales Internationales (Belgium), in Bach’s The Coffee Cantata, directed by himself, in St Kilda opera by Graham and Dessy (Belgium and Grenoble), in a recital in Paris (Winterreise), in Normandy (Autour de Don Giovanni Eros – Thanatos), at manège.mons, Belgium, with Diabolus in Musica. On May 7th 2009, he sang in a concert in Flagey, Brussels, with José Van Dam (Mozart, Boïto). This summer, he has just interpreted Monterone in Rigoletto (open air Opera Festival) in Paris and everywhere in France, directed by Francis Perrin; Alasdair in St Kilda at the International Festival of Edinburgh, and he sang Shubert’s Winterreise during Nancyphonies Festival in Nancy. He will lately perform in Switzerland in a recital whose programme will be made of Russian melodies (Chostakovitch, Tchaïkovski, Rachmaninov).